If you’ve got questions or want to see more details behind the scenes, let me know down in the comments. I’d be happy to share anything! 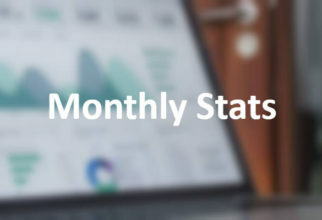 Click here to see all the Growth Stats posts or if you missed last month, you can see it here: Growth Stats – February 2017. This was a month of big wins and big fails. I took a break from blogging for way too long and found out something really depressing about Instagram followers. But even with these issues, I managed to double my Facebook followers and improve my page view count. I published some really neat DIY project tutorials in March. There was the DIY Pallet Wood Bunting and the Basic Pallet Wood Shelf Tutorial which used these Low Profile Shelf Brackets. I also shared that I was Looking for Guest Authors and brought back #4PF with 4 Pallet Friday – Metal & Wood. It was a really great month for content overall. I learned that watching Instagram follower numbers too closely can be really depressing. In the morning, I’d see that I was followed by a few people so I would go check the total and see that it was up. Fun! Then, before bed, I’d check again and see that the total was lower than the previous day. What?! How was this possible? My best guess is that most of my follows right now are just bots and bots get banned. I also believe I have a number of people following me just to get their name in my notification feed. I have had the same guy follow me every other day for the past few weeks. This means he’s unfollowing me too. Even though I saw my Instagram account top 65 followers this past month, I ended the month with 57 followers. I actually went above 60 three different times and below 50 three times as well. The simple math makes that over 30 followers lost, and that’s just what I noticed! This means I lost more than half my current Instagram followers and that’s really messed up. I need to check my stats less so I don’t fuss over what I can’t control. I made some effort on Facebook in March and I doubled my likes. I now have 8 likes on my page and I’m in a private DIY bloggers group which I plan on taking advantage of going forward. Lastly, a lawyer followed my Twitter account. 4 follows total on Twitter. Oh bother. March was a bad blogging month. I did absolutely nothing for the first two weeks and I didn’t publish a 4 Pallet Friday post for 5 weeks! I deserve the lackluster stats for sure. But with a slightly larger social following each month, I should see bigger interaction with even the least amount of effort on my end. Still, I need to get better at publishing regularly. 6 posts were added in March; the same as February. 0 new newsletter subscribers again, and until I reveal what the newsletter offers, I don’t expect much. Only 2 new comments. 179 new page views this past month. Exactly halfway between the previous months. That’s quite telling. I think I should now expect very slight improvement each month as I have more archived content for new visitors to peruse. I’d definitely like to see 500 views per month very soon. But I can’t be unhappy about what I’m getting just 3 months in. Also, it’s obvious that more posts means more views. So I’m going to keep working on publishing interesting posts and try for more social interaction to get those posts in front of more people. Hey, I did it again. A whole month went by and I never made anything to sell in my Etsy shop. Except I kind of did. I just haven’t made the final version yet, nor have I announced it will be for sale. So no traction on Etsy yet but I’m hopeful for April. 0 products, 0 sales, and 0 new follows. Duh. I learned some interesting things this past month. Looking at the data reaffirms what I was suspecting during the month of March. Instagram is technically advancing, but stumbling on its way. Facebook is my biggest relative winner with double the followers. And I need to be more consistent with my publishing to see the viewership improve. Last month I pledged to use Twitter and I didn’t. If I do it, I’m sure I’ll get some return. But now I just have to follow through. I did publish a new post asking for guest authors, but I haven’t personally requested any collaboration yet. This month I need to reach out directly to other makers and get the ball rolling.